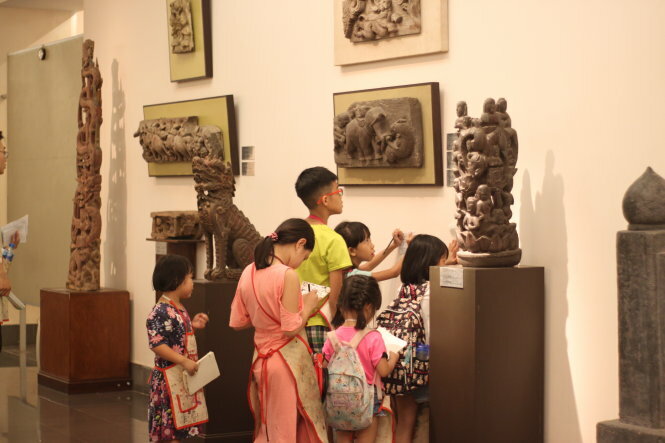 Young learners of Ti Toay are seen during a field trip to the Vietnam Museum of Fine Arts in Hanoi in this photo supplied by the center. 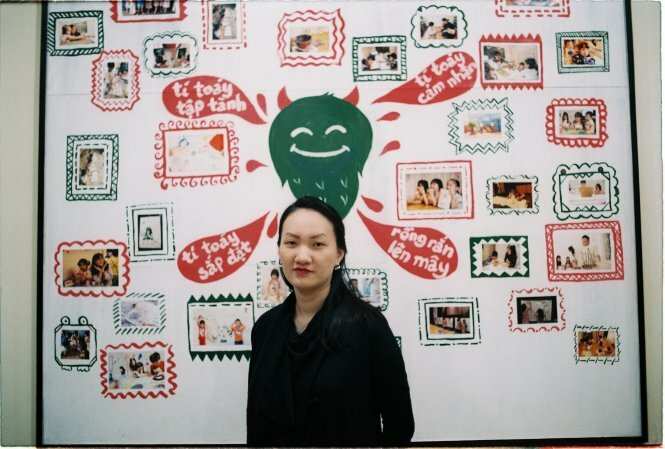 Believing children should be exposed to the art world at a young age in order to tap their full potential, a married couple in Hanoi has established a private art center to nurture a love for arts amongst kids. Ti Toay, a Vietnamese word that describes subtle arm movements, like fidgeting, has been in operation since 2013. The art center maintains a stable workforce of 35 personnel responsible for the roughly 500 learners who study at its four campuses each month. Unlike other conventional art schools, which adopt patented courses from mostly foreign sources, Ti Toay utilizes its own nine instruction manuals, which capably cater to various targets, from the elderly, retirees, to elementary schoolers. But prior to such a scale of operation was a silent struggle of individuality. Everything began in 2013, when couple Le Dang Ninh, now 32, and Nguyen Thuy Trang, 31, decided to fulfill the woman’s dream of making a difference in the country’s art teaching landscape. Hailing from a family long attuned to artistic pursuit, then-25-year-old Trang was dissatisfied with Hanoi’s extracurricular art courses. The fact that such courses were similar to crammers, where children were taught the end justified the means as parents only admired their final results, does not please Trang, who believes art studies can unlock diverse perspectives and give way to boundless imagination, which in turn yields creativeness. Despite such positivity, art has never truly flowed in modern Vietnam – evident as the subject is considered secondary in general education, while its higher education aspirants dwindle by the time. Worse still, due to the pressure stemming from standardized exams, as well as rigorous academic competition, it has often been found at the lowest of priorities for both students and parents alike. The art education market is equally unhealthy. Many Vietnamese art institutes received sponsors from international organizations, and passively call for enrollment only during summer breaks, during which they were assured of the stable flow of learners. Once the academic year starts, most of these institutes would maintain a low profile as they patiently wait for summer. Furthermore, art in Vietnam is often restrained and regulated into a common path by the responsible, which could not see much growth for young practitioners, if any at all. No wonder the market is very humble, and circulated only around a handful of those accustomed to the flair. Fully intending to revert the situation for the better, the Ninh-Trang duo were determined to take matters into their own hands, via an art establishment of their own. “Nurturing young minds with art has never been a walk in the park, yet it does not mean the challenges posed are impossible to resolve,” Ninh affirmed.  With only VND20 million (US$862), the couple ran the first of Ti Toay’s sessions in 2013. Save for Trang’s art-media master’s degree earned in France on a scholarship, and the fact that both were not shackled to common practice, almost every other element was working against them. Ninh and Trang knew nothing of business administration, and their ‘center’ at the time was just limited to a 15-square-meter room, packed full with six students who already knew one another before they met in this class. But with the support from like-minded parents, plus Trang’s immense knowledge of artistic approaches, they supplemented what learners could not achieve at their main schools, and steadily worked themselves up. At Ti Toay today, all drawing materials are employed, and the curriculum development process evolves around the visual/applied/media art field trio to boost growth in students in the most diverse, yet natural way possible. Nguyen Thuy Trang, co-founder of Ti Toay, is seen in this supplied photo. To comprehend the nature of art, and how it assists the cognitive expansion of young minds, adults should never rush the process for a hastened result. Instead, Ti Toay encourages its learners to shy from judging the-end products on a score-based chassis, and puts more effort on the journey of each individual. It is not the fanciful outcomes, but meaningful build-up that enhances mental development. “Should parents and children alike regard experiencing art as a journey, then both will benefit greatly from such a creative mindset,” Trang said. To spark curiosity, enable healthy growth, while entertaining young minds, it is not the art, nor the materials, but each soul’s experience in the ordeal that calls the shot. Such an approach to art has been scientifically claimed as positive as it improves language proficiency, mathematical immersion, stress reduction, and other factors. But maintaining a growing Ti Toay while remaining true to its original creed is not an easy feat. Besides making an effort to alter the adults’ school of thought, Ti Toay also has to instill within its workforce a sense of creativeness, and fiery passion for art. That is not to say the center, due to their focus on inner quality, has faced rising financial problems for quite a while. Yet those are not the most pressing matters. For Ninh, what he deems the most challenging task is to keep hold of the learners’ excitement, and interest for the practice. Ninh hopes to see them change for the better after attending his courses, admittingly not a piece of cake after all. Trang, now a university instructor and a mother to two children, shares the same view as her husband. The artist-turned-teacher surmises that both occupations relate majorly to creativity, only with different results. While an artist puts drawings up for exhibition, an art teacher shapes young aspirants into proper human beings, capable of moral goodness. In this day and age, even though art practitioners can learn on their own by using the Internet, human-to-human interaction remains steadfast as ever for the sake of esthetics and individual identity. About Ti Toay, both husband and wife agree that their journey is only just beginning. “For us, success is the sheer persistence amidst sprawling challenges. We will see how far our passion can carry us,” Ninh stated.